Set up your arena, choose your team, and put your skills to the test! 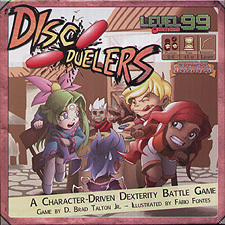 Disc Duellers is a character-driven game of strategy and skill. Build a team of characters with unique and diverse powers, equip them with gear, take aim and attack. And duelling is just the start! Disc Duellers contains rules for Racing, Soccer, Volleyball, and Large Team Games! This is a real-space game that can be played on any tabletop by any skill level of player.